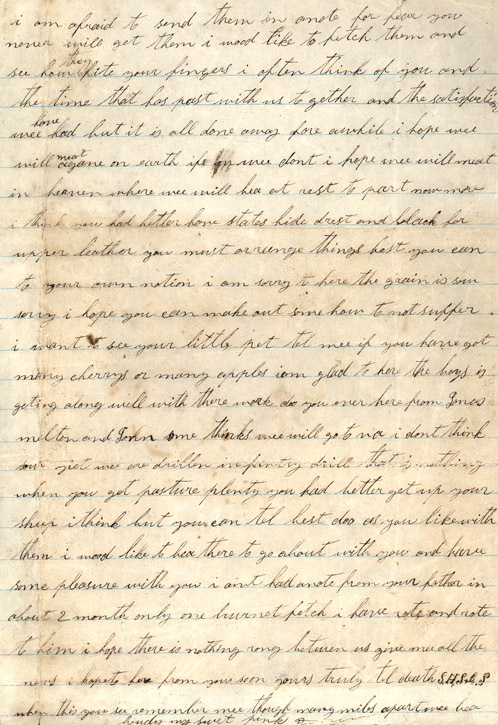 Letter from Silas Stepp to his wife informing her of his capture by the Yankees in 1864 and later describing details of captivity. 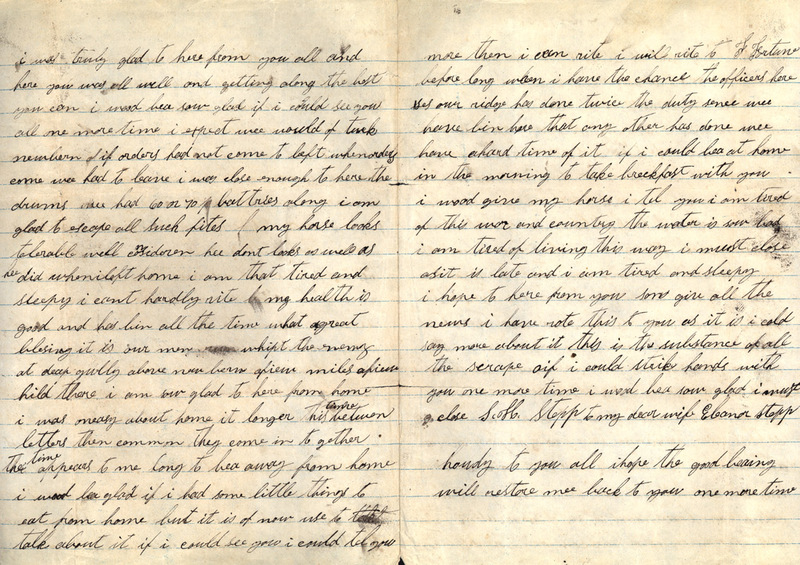 Silas H. Stepp Letters, D.H. Ramsey Library Special Collections, UNC Asheville. 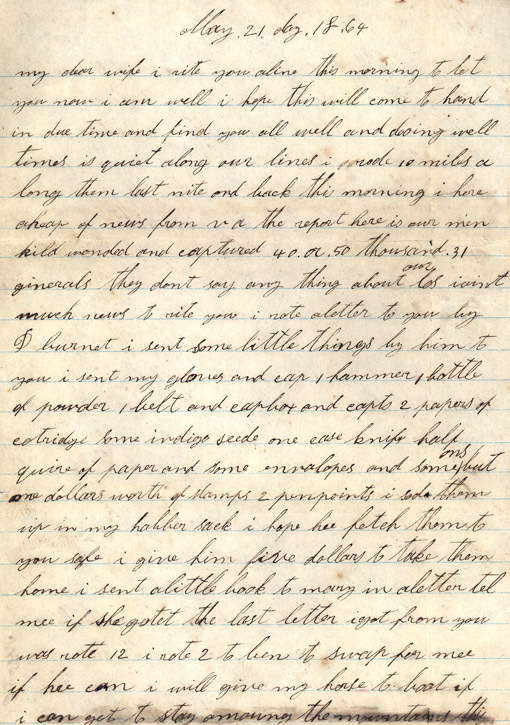 Description Donated by Evelyn Cordell Romeo, great-granddaughter, the 17 letters of the Silas H. Stepp Collection detail critical days in the life of a Civil War soldier. 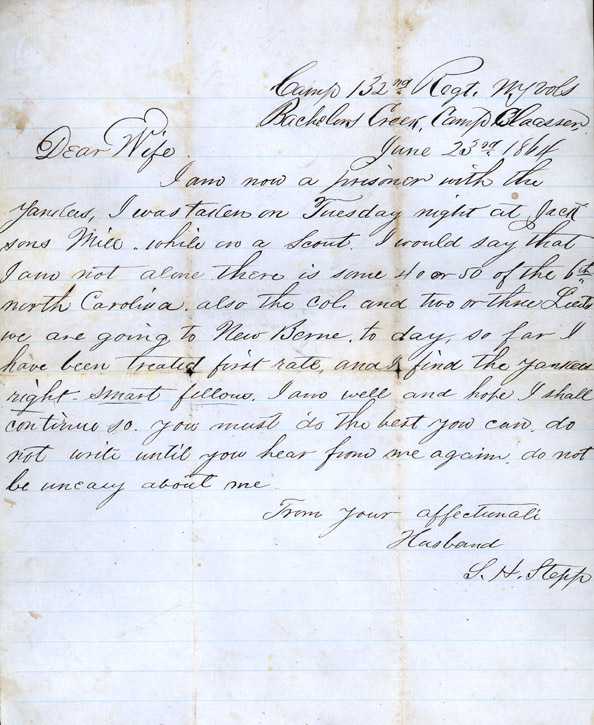 Stepp enlisted in the Confederate army in Company D, 7th North Carolina Cavalry Battalion on April 27, 1863, in Buncombe County, NC. On August 3, 1863, he was transferred to Company C, 6th North Carolina Cavalry Regiment and was captured June 22, 1864, at Jackson's Mills, NC. Imprisoned first at Point Lookout, MD, he was later sent on July 8, 1854, to Elmira Prison, NY. He did not survive the war. 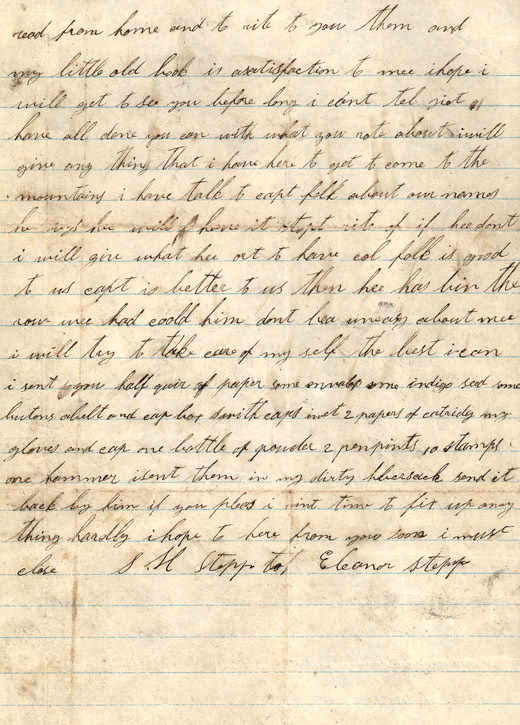 On January 2, 1865, Stepp died of "pneumonia and Chronic diarrhea," while a prisoner at Elmira. 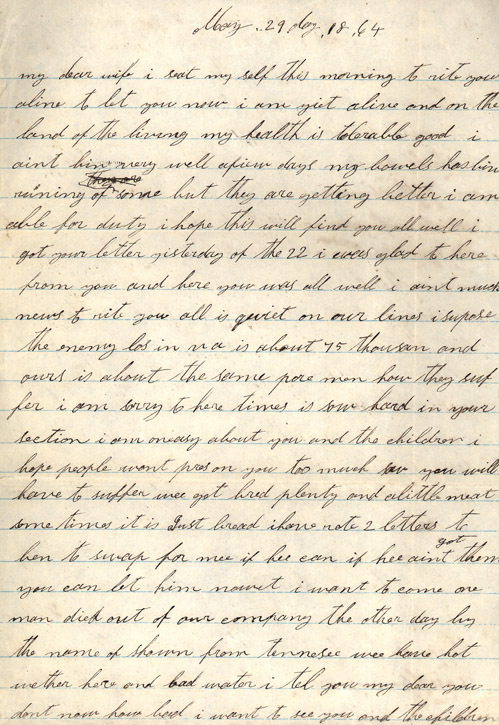 These letters written to his wife, Eleanor Stepp, are both poignantly personal and informative with regard to troop activity in the war years. 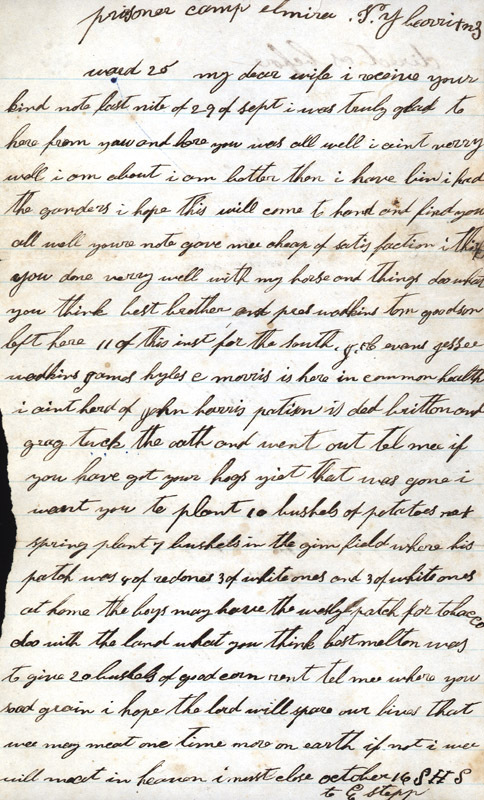 This collection provides electronic facsimiles of the 17 letters. The originals have been retained by the family. Some supplemental photocopied information has been provided with the letters and is included in a folder for the benefit of researchers. Publisher D.H. Ramsey Library, Special Collections, University of North Carolina at Asheville 28804. Contributor Evelyn Cordell Romeo, great grand-daughter of Silas Stepp. Format 1 small manuscript box. 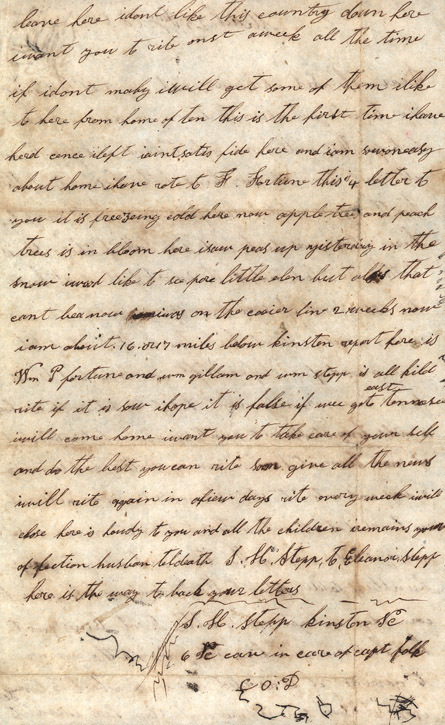 Letters in digital format only. Rights Any display, publication, or public use must credit the D.H. Ramsey Library, Special Collections, University of North Carolina at Asheville. 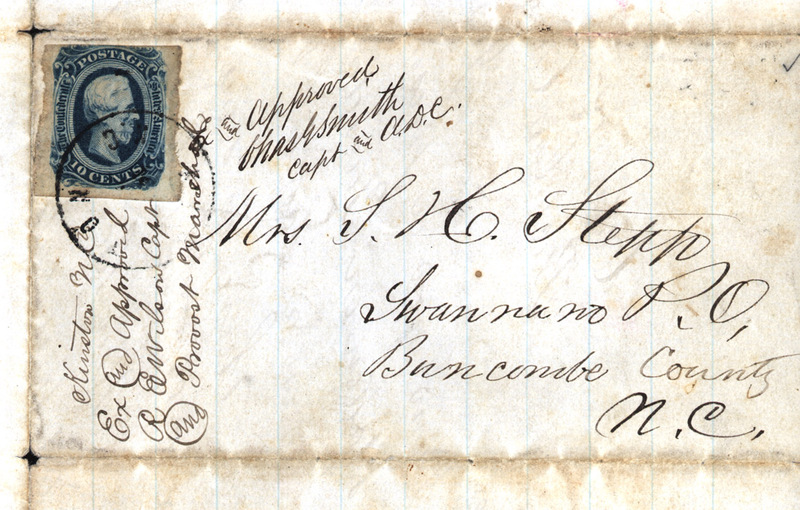 Silas Stepp, a Confederate soldier in the Civil War was born 1823. He was the brother of Azor, Elizabeth (a twin of Azor), Joshua, Fidillia, and Joseph. [Where was he born ?] Stepp was married to Eleanor Nellie Fortune, who was born March 3, 1825. Her brother Ben was also a soldier, and her sister was Lydia Fortune Brown. 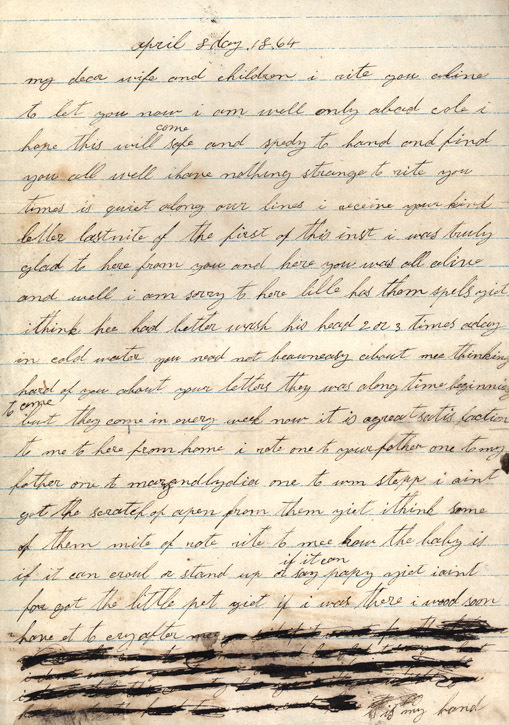 Stepp and Eleanor had five children, Joseph, Ellen, Billy, Mary, and Silas Jr.
On April 27, 1863 in Buncombe Silas Stepp enlisted in the Confederate army in Company D, 7th North Carolina Calvary Battalion. During the war North Carolina was the only state that did not provide clothes for their soldiers, and all Confederate troops had to provide their own mounts, upon entering the Battalion Stepp brought a horse from home. 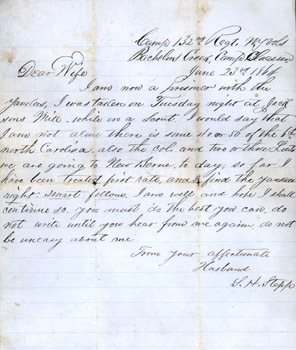 On August 3, 1863 Stepp was transferred to Company C, 6th North Carolina Cavalry Regiment. 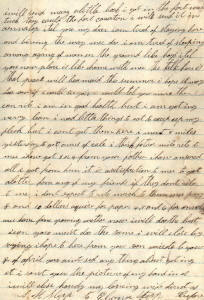 In early 1864 Silas asked his brother-in-law, Ben, to take his place in the war. Ben had been discharged earlier due to unknown reasons, and never returned to the war. 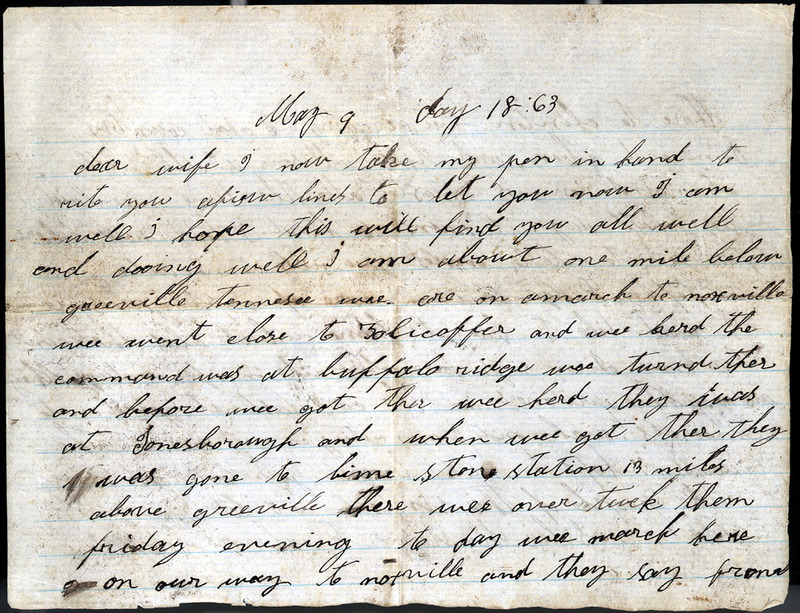 On June 22nd, 1864 Silas was taken prisoner at Jackson’s Mill, North Carolina, while scouting the area. He was sent to New Berne on June 23rd for four days, and then on to Fort Monroe. A day later he went to Point Lookout, Maryland for a week and then ended up in Elmira Prison in New York. * His brother Fidillia was also imprisoned with him in Elmira. 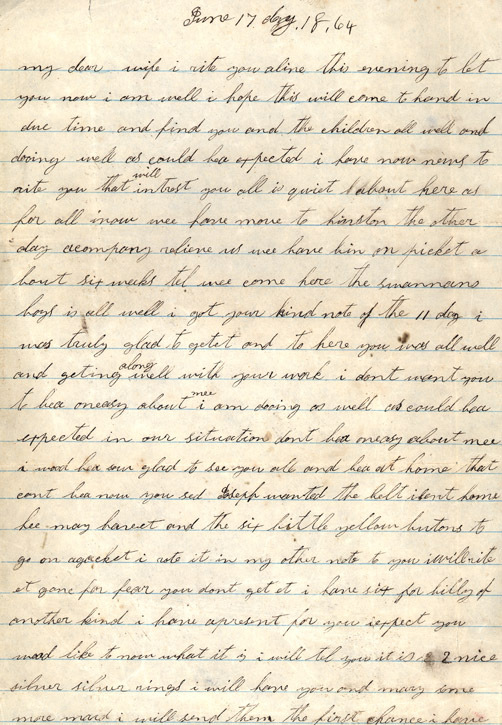 In his letters from prison, Stepp reported that he was in good health and that he was being treated well, however, his health deteriorated and he contracted pneumonia and chronic diarrhea which led to his eventual death in prison. He died on January 2, 1865 and was buried in Elmira. His brother Fidillia survived the prison and the war. In August 19, 1897 his wife Eleanor died and was buried in Tabernacle Church Cemetery in Buncombe County. All of Silas’s siblings except for Joshua survived the war. *Note: Conditions at Elmira were very poor. The prison, only used for two years, was designed to hold approximately 5000 prisoners but during the peak of the incarceration, the prison held some9400 soldiers. Health conditions quickly deteriorated and before its closure, some 3000 soldiers died while imprisoned. 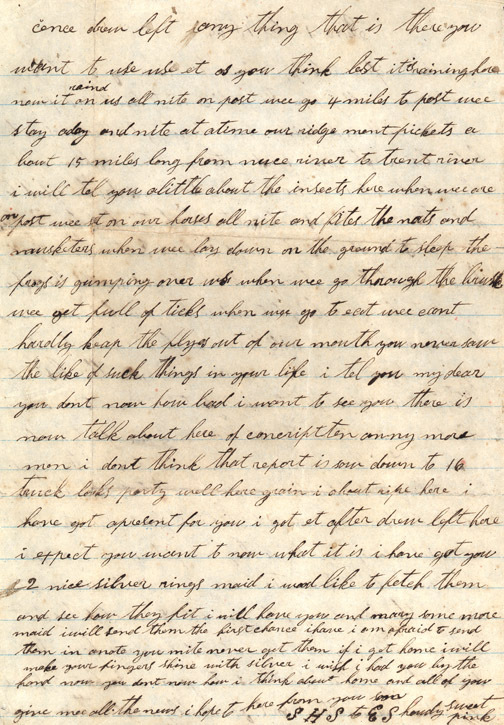 3-23-1864b March 23, 1864 Silas tells his wife about "hard times down here." He describes his activities and observations including picket duty, weather, news of deaths. He is writing "16 or 17 miles below kinsten [Kinston]" North Carolina. 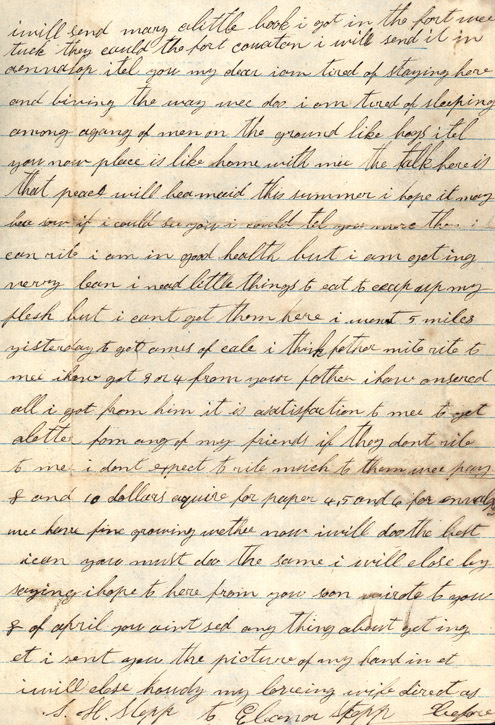 4-9-1864a April 8, 1864 Silas tries to catch up on home life in this letter. He mentions having a bad cold and offers suggestions for those at home with their ailments. 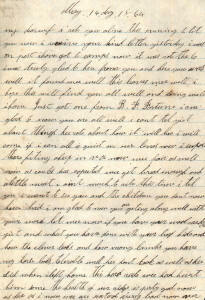 5-7-1864b May 7, 1864 Silas has just returned from a raid and spends most of this letter writing about it. At one point, they spent the night in mud that, "was belly deep." 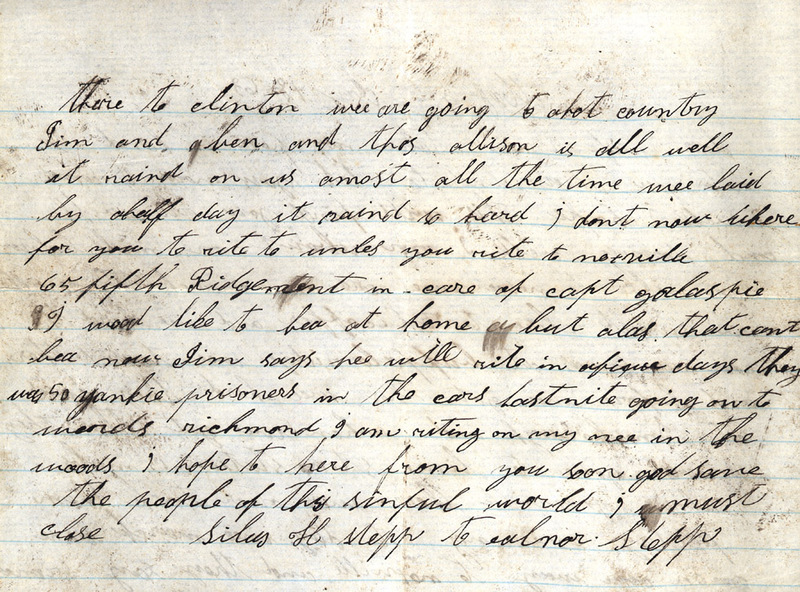 Like the May 2 letter, he writes of being tired of the war. 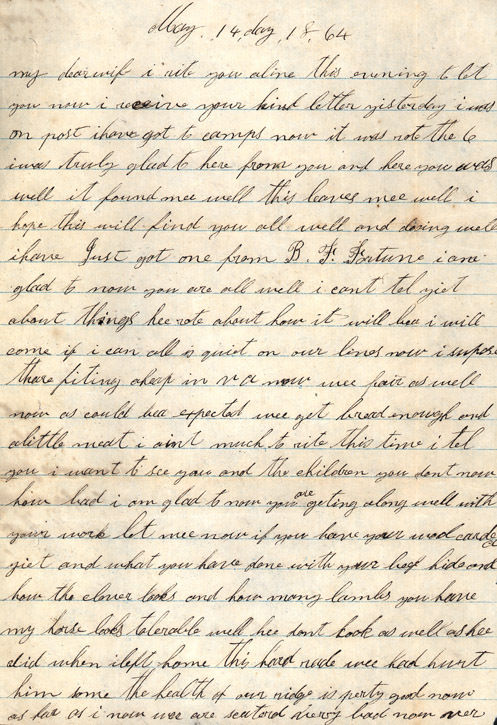 5-14-1864b May 14, 1864 Silas desires to see Eleanor and the kids badly. Writes about his horse & himself looking thin. He is "tired of sleeping among a gang of men on the ground like hogs." 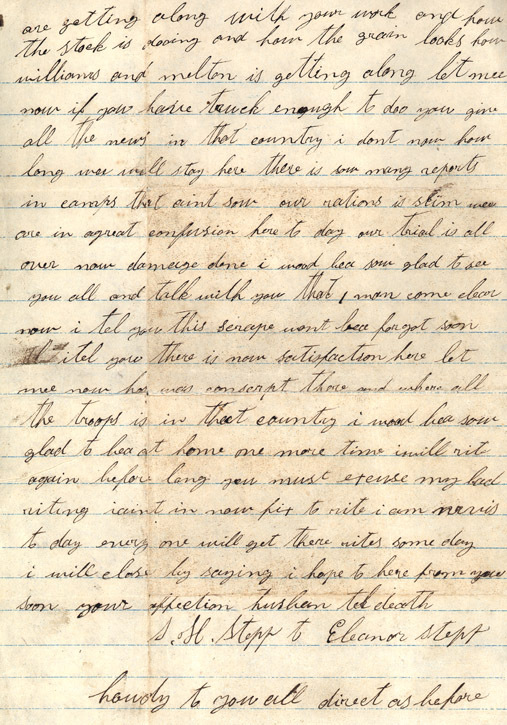 5-17-1864b May 17, 1864 Tells Eleanor that he cannot come home to the mountains this summer and to send clothing to him. Silas also sent a number of items home. 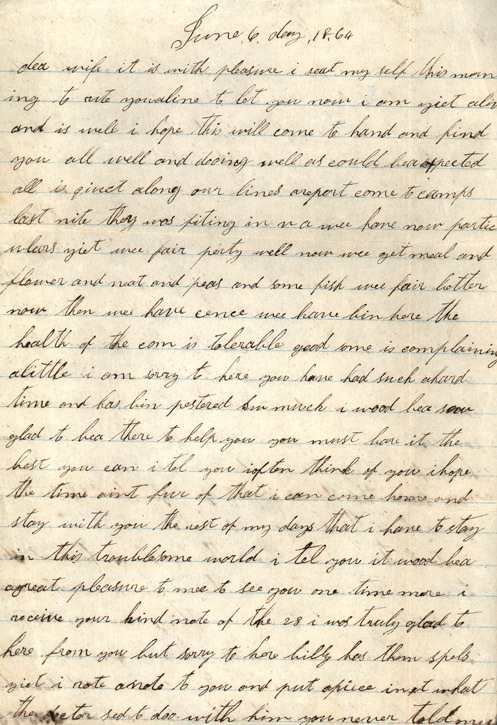 5-21-1864b May 21, 1864 Silas reminds Eleanor of the items sent (May 17). 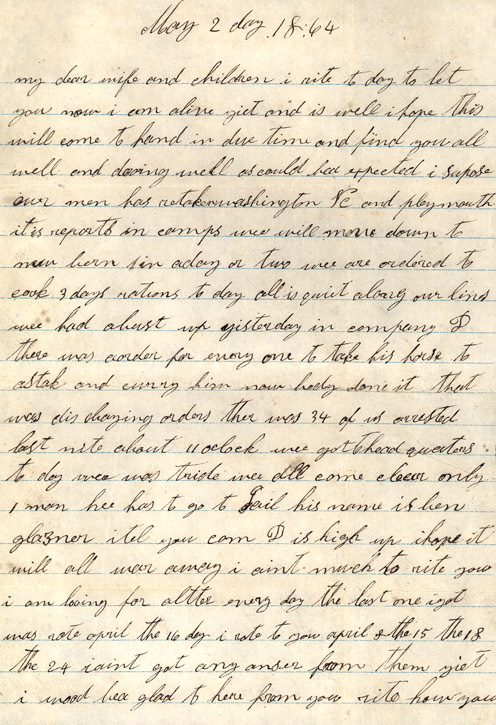 He mentioned writing to Ben, Eleanor's brother, about taking his place in the war [Confederate soldiers, who were financially able to do so, could hire someone to take their place]. 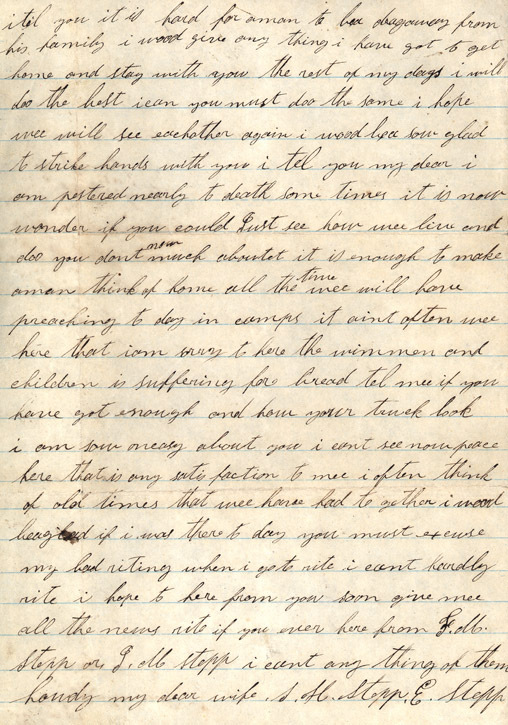 5-29-1864b May 29, 1864 "i would give any thing i have got to get home and stay with you the rest of my days," writes Silas. He is uneasy about his wife and the children. He estimates the enemy loss to be at about 75,000 in Virginia with "ours about the same...pore men how they suffer" [probably from Wilderness Campaign, losses actually 29,800 for both sides]. 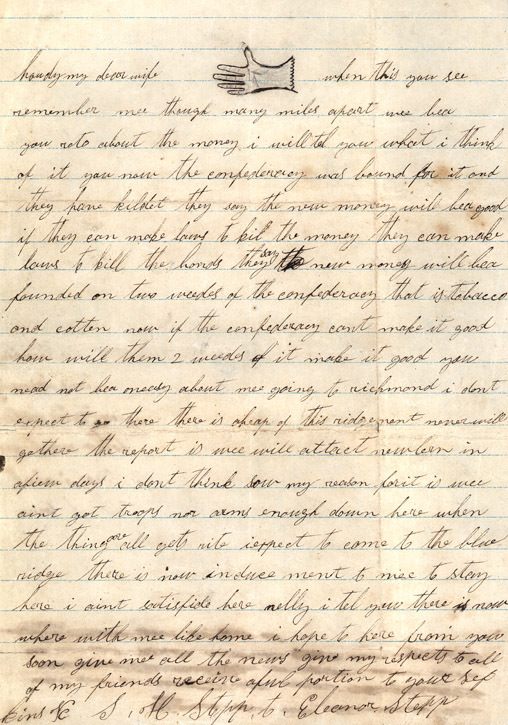 Silas says he wrote two letters to Ben to take his place (see May 21). 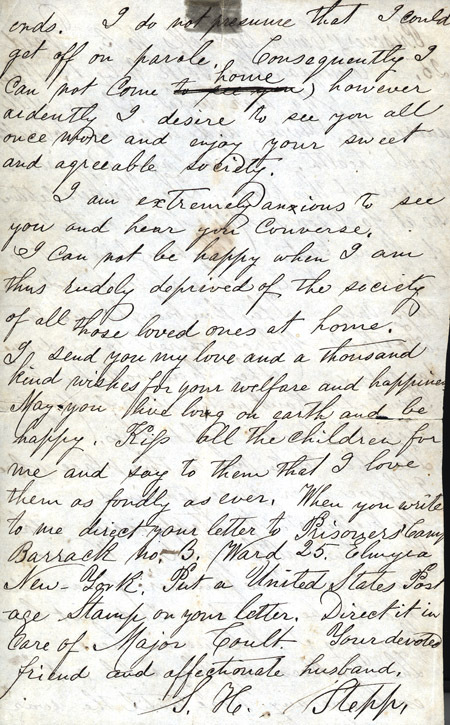 At an increasing pace, Silas' letters are becoming restless in his desire to come home to his wife and children. 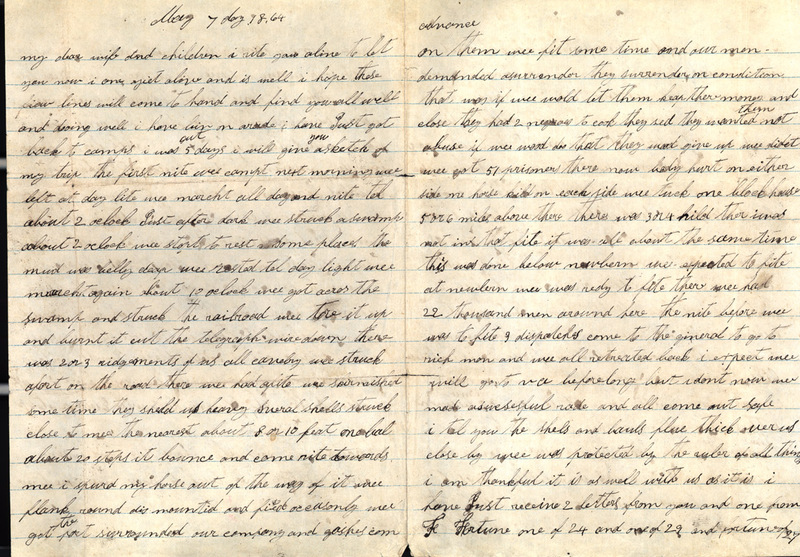 6-1-1864b June 1, 1864 This letter informs Eleanor that there are Yankee deserters from the New Bern area, just like the the Southerners. 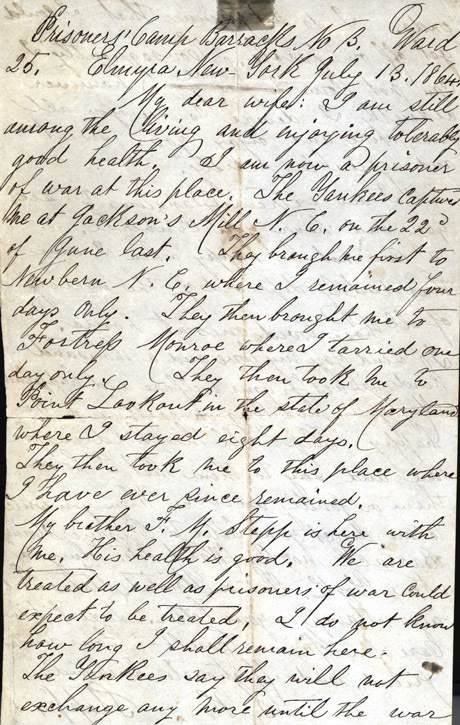 Silas had been informed that the items sent to Eleanor have not arrived and are probably lost [see May 17]. He mentions that if Ben swaps for him, for Eleanor not to write anymore. 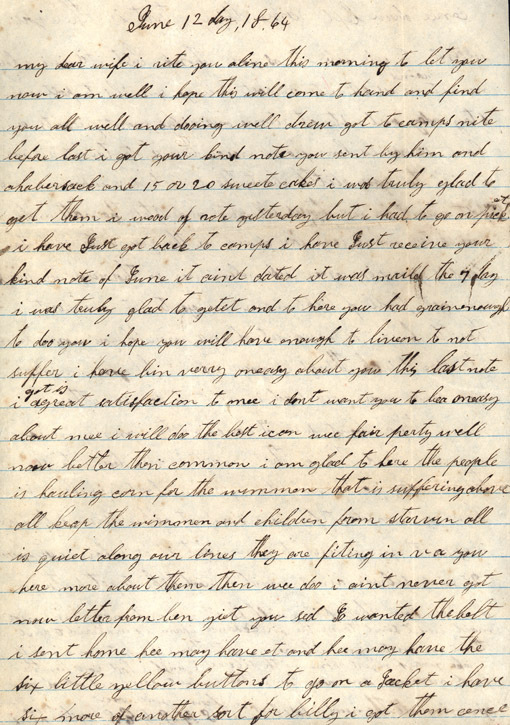 6-6-1864b June 6, 1864 Silas is concerned that Eleanor is holding back on something, or was too afraid to verbalize the matter in the letter. 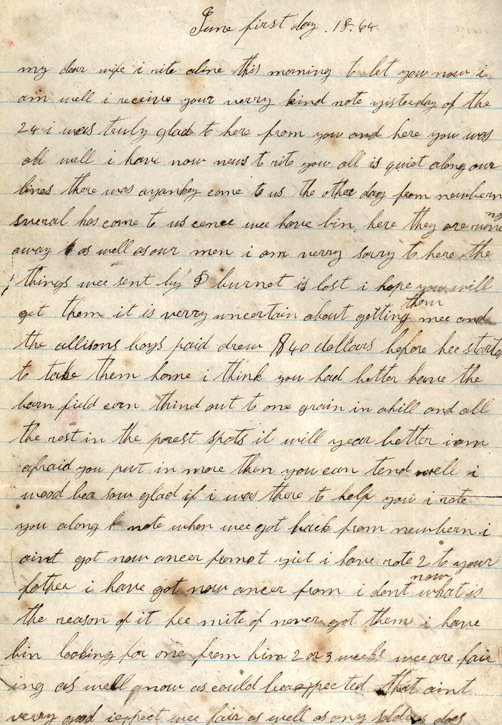 Silas asks that she "rite what you please and fasen it up good" and to "rite to me any thing you want to"
6-12-1864b June 12, 1864 Silas is pleased to learn that folks back home are helping the women and children by giving food (corn). He also describes his problems with insects around the clock --- "fites the nats and musketers." Silas is more optimistic in this letter. 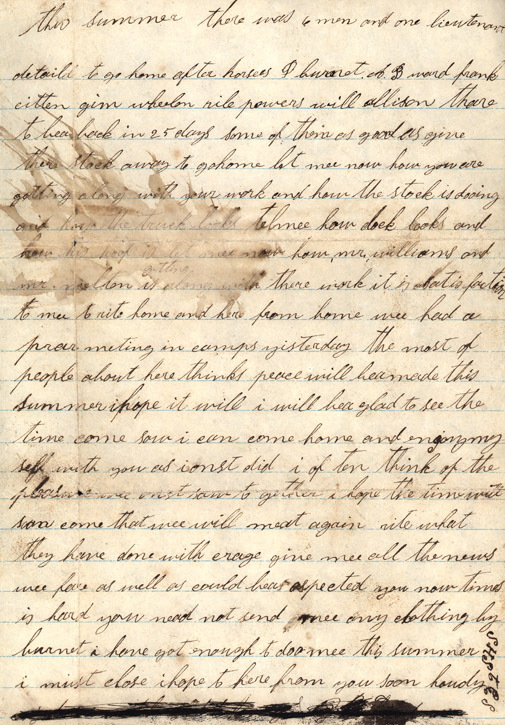 6-17-1864b June 17, 1864 Silas writes from Kinston, NC. 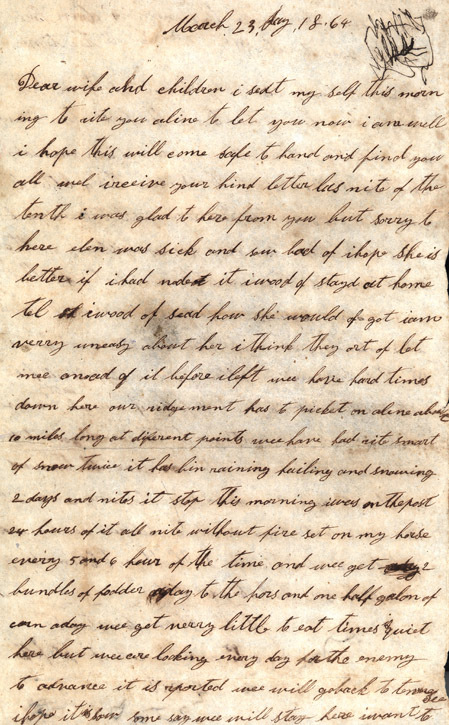 He reminisces about his home life and ends his letter by hoping nothing is wrong between Eleanor and himself. 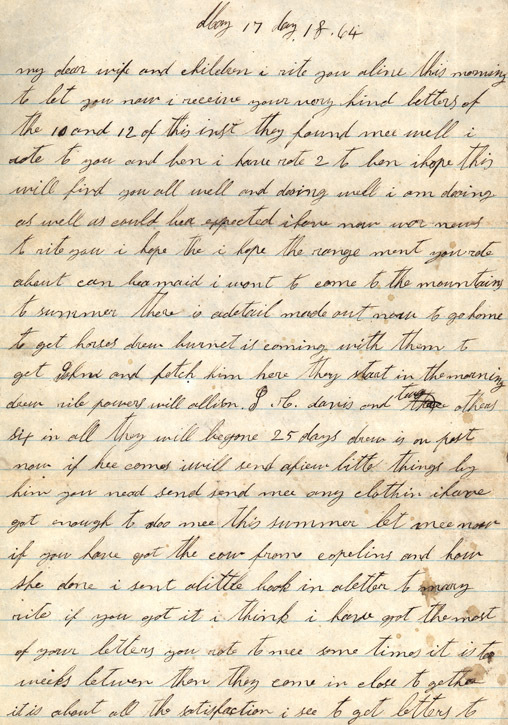 6-23-1864b June 23, 1864 Silas recounts his capture at night by the Yankees at Jackson's Mill. He advises Eleanor not to worry. 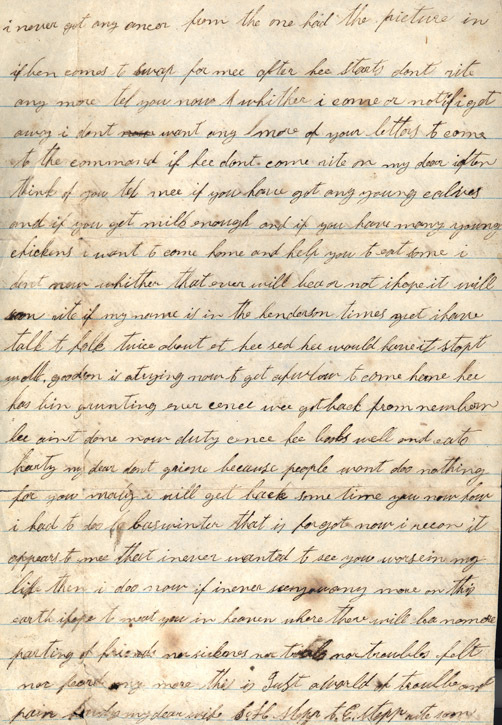 7-13-1864b July 13, 1864 This letter is not in Silas' handwriting. Another wrote it for him. In it, Silas' explains how he was captured and ended up at the Union prison complex in Elmira, New York. 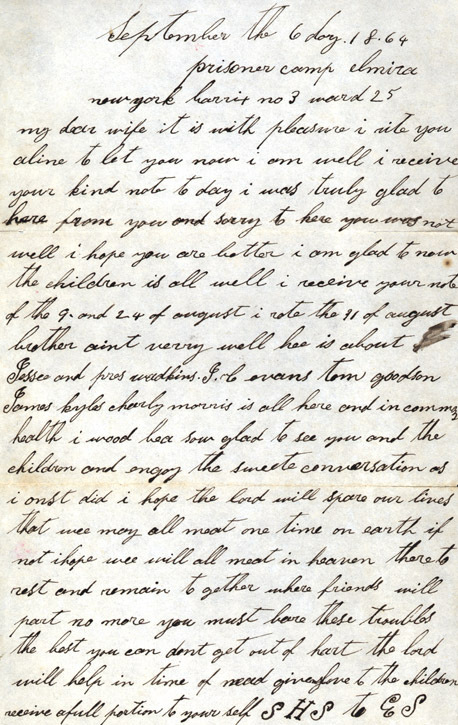 September 6, 1864 A brief letter to Eleanor saying that he is well and is sorry to hear of Eleanor's sickness. 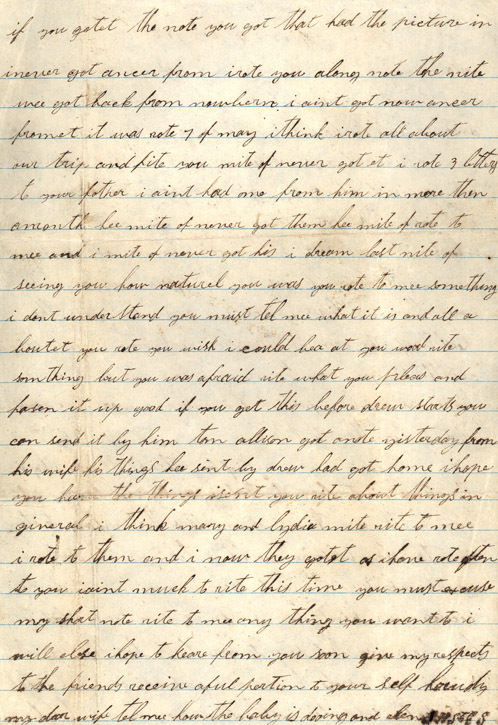 October 16, 1864 Letter from Silas instructing Eleanor about planting and praises her for taking care of their horse and other things.